This is a useful play to know about in the early endgame. It corrects the aji in the enclosure, when White is strong locally. TDerz The 2nd-line kosumi puzzled me. 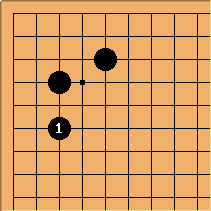 Would this one space extension, , do the same as above kosumi, S1? The difference seems to be that in the case of and , black seems to be obliged to play a, whereby White gets a forcing move at 4 (see next diagram below). 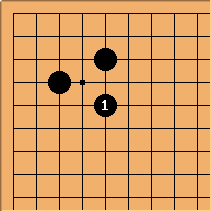 If here, then White can live with and because black's cut at b is not protected and he cannot play c.
The circled exchange could also happen without the stone present in first place! 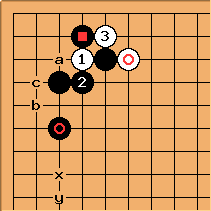 In this case I would prefer to play it further away from the shimari (x, y: later). 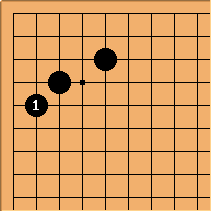 Can I deduce herefrom that Black should not play in first instance (and Charles's kosumi above is better)? 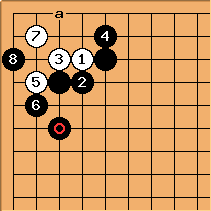 When to play kosumi, when to play tenuki? Bill: I confess to being flabbergasted by the discussion of the kosumi to the second line and the one space extension. Not by the plays, which may be best under certain circumstances, but by the diagrams showing them, in which they are almost certainly horrible plays. Charles Bill, this would be another case, in which your implicit convention shows up. 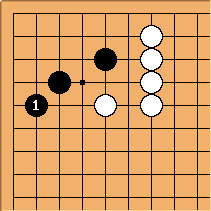 Sure, if there were no white stones at all in this quarter of the board, the diagonal to the second line is a sort of ridiculous, novice play. But obviously I didn't mean it that way. Do I really have to clip my diagrams down, to make them beyond criticism along these lines? I really don't believe that (as I wrote elsewhere) there is an SL convention that empty points are taken to be empty, rather than possible wild cards. 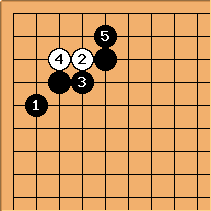 Bill: Even if the empty points are wild cards, the kosumi above doesn't make sense to me. If you are expecting the reader to fill in the appropriate surroundings, you are asking a lot, IMO. I see it as a question of clarity, not convention. For instance, in this diagram White is strong locally, but does not seem right. I know that is not what you meant, but that's my point. 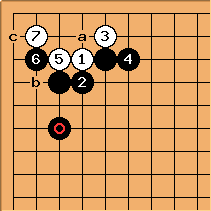 You and I and other dan players may be able to recognize situations where the kosumi is appropriate, but how about the average go player? I do not think that clipping the diagrams would be much clearer, either. You are still relying upon the reader to fill in the blanks appropriately. Those who can do so probably do not need the advice. Charles You know, I was shown this play by my national champion, a strong ama 6 dan. I assumed that passing it on might be of some help. This is a common way of strengthening the corner. It is also questionable in this context <sigh>, but better. TDerz Flabbergasted - me too! Such a nice, simple move. It has influence too. This is much more the move which will fit usually and cannot be bad. This cap is also good for reducing black's expansion in a moyo game. Your opponent's good move is your good move.